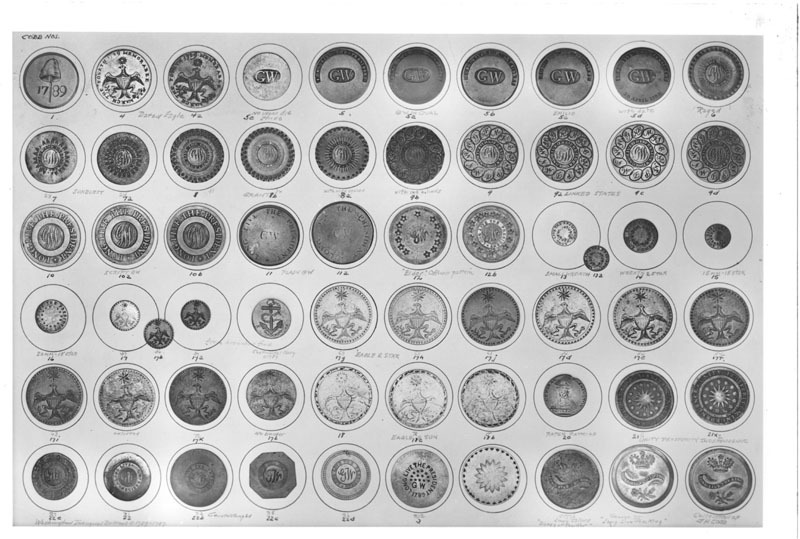 All of the buttons in this plate were at one time part of Harold's collection. He traded many, but at one time had 60 GW's. He kept the finest. Harold was the first major collector of GW's starting in the early 1950's. Over the years, he kept notes and research material on the types and numbers of buttons available, and with the encouragement from fellow collectors, put the results in his book. This book is itself a collectors item with only two printings, one in 1963, and a revised version in 1968 (revised with permission by Elmer Piercy). I have further revised it and put it in .pdf format and with the family's permission make it available for downloading. Get the book "George Washington Inaugural Buttons and Medalets, 1789-1793" (revised January 27th, 2005. Corrected some typos, added new pictures and photo plate). Harold passed the collection to his son Lloyd, before his death in 1969. Lloyd died the following year, and the collection went to Lloyd's wife Joan. She kept the collection for her children until her recent death in August, 2002. Harold found great joy in helping others with their GW collections, and he had his agents constantly looking for these rare buttons until his health slowed him down. The collection has now been sold in Stack's of New York January 21-23, 2003 Americana sale, lot numbers 1326-1365. The catalogue is a keeper, with excellent color plates of the collection, and the descriptions make this an excellent resource for GW button collectors. I've posted an update with the prices obtained so that this site can act as an online resource for collectors curious as to some values. Then again, maybe it won't be such a good guide. One major button dealer stated the prices were astronomical. Buyers pay a 15% buyers fee on the hammer price, so the amount paid for the buttons are even higher than I've reported. The sale set records for prices of many pieces. We're very excited! The collectors picked out the gems of the collection and paid what were said to be unbelievable prices. Button collectors and political historical collectors seem to have been outbid by coin collectors in the sale. Stack's has the hammer prices online, but they match what we were giving earlier. An interesting article in the February 10th, 2003 issue of Coin World adds some interesting background to what happened at the sale, as well as the collection itself. My thanks to Coin World for permission to post this article here. Another article in the Maine Antique Digest gives another perspective of the sale. View it here. My thanks for the kind permission to reprint the article here! I've been contacted by several people asking for help in selling individual buttons that they possess. I'm happy to do what I can. My advice is to contact Stack's and ask for Michael J. Hodder. He's now the acknowledged expert in the field of GW's and has an obviously outstanding track record in successful sales of the same. Stack's has negotiated for another large GW collection, and now probably has the largest stock of these buttons in the world. Stack's had the catalogue online, but no longer. Here is the introduction to Washington Inaugural buttons by Dr. George Fuld. HERE. If your interest in GW's has been stirred, you should visit Mr. Scott Dolson's fine website, politicalbadges.com, particularly his section on Washington Inaugural Buttons. The collection has been catalogued by numismatic expert Michael Hodder for the Stack's catalogue, and I've modified this site with the new information he's come up with, including corrections to Albert and DeWitt numbers, and composition. Harold indicated copper composition for a lot of buttons that Mr. Hodder feels are brass. A list of the items in his collection are as follows using Cobb #'s, as well as "Political Campaign and Commemorative Buttons" by A.H. Albert, 1966 and "A Century of Campaign Buttons 1789-1889" by J. Doyle DeWitt, 1959. Note: Some of the variants were unknown to DeWitt or Albert, in which case they didn't list them with individual numbers. ***Warning*** Clicking on the plates will download a MUCH larger and detailed picture. I've added links to individual pictures of each button if you click on the Cobb #. On several occasions I've received emails from folks either wanting to buy or sell GW's. I've been referring them to Stack's, but now I've been informed that Stack's no longer has any GW's. I'm sure they'd still be happy to purchase buttons, but I thought I'd offer a means of contacting interested parties here. I will provide a list of email address of those looking to buy, and those looking to sell, and interested parties can contact them and make their own arrangements. Email me with your request and a subject that refers to GW's and I'll place you here. I cannot accept responsibility for deals that fall through. I'm trying something new. If I find an auction of GW's, I'll try to add a link to the website of the auctioneers. If you are auctioning one off, let me know, and I'll add you to the list. I stumbled upon Stack's Bowers Americana auction and found they have 10 GW's on the block, most of them Cobb pieces that they purchased when no bids were obtained at the 2003 Cobb sale. They ARE high quality! Check out lots 6189-6198 at their website.